Our family event with the Arnold family was a powerful experience. Little Bradley, age 5 (now age 6), was diagnosed with kidney cancer on November 14th, 2017. He had major surgery to remove a 3+ pound tumor & his left kidney, followed by a lung biopsy. Bradley underwent a 19-week chemotherapy plan. He had a clean bill of health, until weeks ago, when a new spot was found. More treatment is in the future. As for the event, we partnered with the Geneva Cancer Run, a local 501c3 that raises money for families dealing with cancer. The run is an annual event, and it happened to land on the same day as Bradley’s benefit – seriously! The Geneva Cancer Run decided to make their first stop at the Arnold farm for lunch. The site and sound of 150+ bikes coming down the road and into the driveway is unlike any experience I’ve ever had. Bradley waited in awe and watched as the bikes rode by him one by one, waving and honking. The bikes parked and headed for cover from the incoming rain in the shed, where lunch was served. After everyone was served, the GCR folks, in partnership with another biker group, ABATE (American Bikers for Awareness, Training, and Education), presented Bradley with some Harley Davidson gear. Then, they presented a three-wheel motorized Harley Davidson tricycle. The Geneva Cancer run donated just shy of $1,000 to the family. Upon returning to Geneva for the cancer auction, the auctioneer placed a plate on his head and took in more donations as he walked around, adding another $300 in cash, all given to the family. As for our foundation, we followed the presentation with our own. We presented the boy with a gift bag from the Mall of America, including stuffed animals, cards, drinking cups, books, and many coupons for free entry into the different amusement zones at MOA. We also presented the family with a gas card, an MOA shopping card, and a two night stay at the Radisson Blu, connected to the MOA. The mother was crying through most of both presentations, and was extremely kind, grateful, and appreciative of all our efforts. This will go down as an experience none of us in attendance will ever forget, and hopefully will lead to an experience the boy and his family will never forget! We had our first mission completed in Houston! 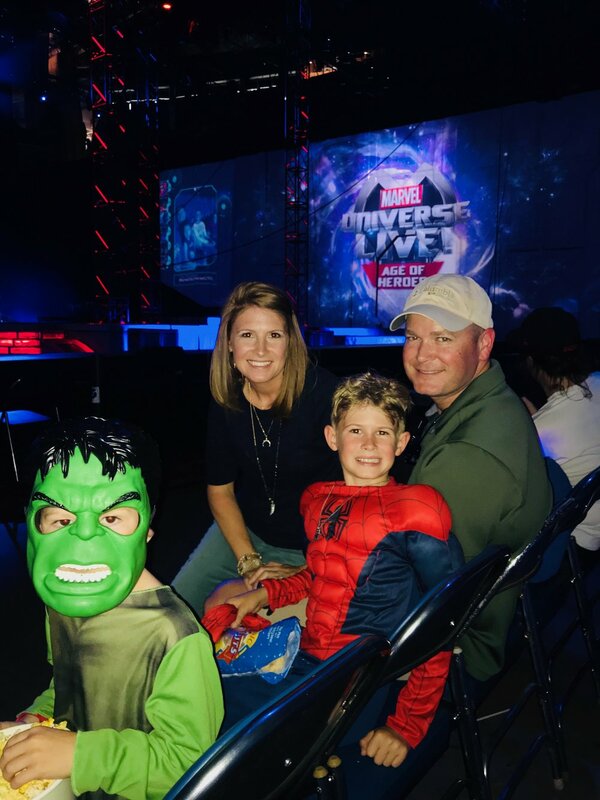 We were able to take Nolan, who is 6 years old, to see a super heroes show called Marvel Universe Live! Nolan was super happy about the show. He was wearing the costume of the Hulk. He went to the show with his brother and his parents. 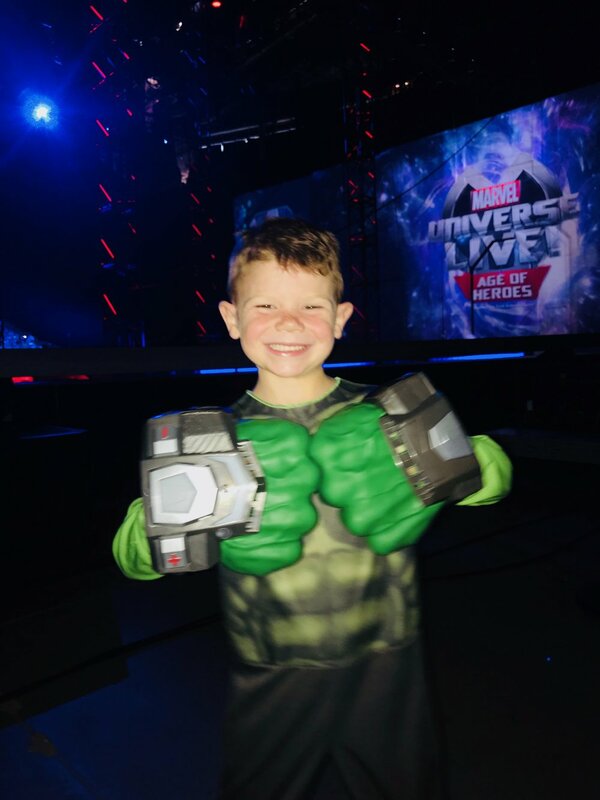 We want to give special thanks to @MarvelOnTour for donating the tickets to Nolan and his family.